My BASE WEIGHT is about 14 pounds, with my SLEEP SYSTEM representing 16% of the weight at a little over 2 pounds. This is probably the most important decision you will make. Finding yourself cold miles from a trailhead makes not only for a long, miserably night, but can also be life threatening. Of course, like any important decision, this one is complicated and includes many considerations. Down – Type of down, fill weight, baffle construction and fabric choice will affect price, temperature rating, weight and compressibility. Water Repellent Down – Many bag manufacturers now offer this as an option, the downside is that as compared to down it is a bit heavier and has reduced breathability. Synthetic – On the positive side, as compared to down, synthetic bags are usually less expensive and insulate better if damp; the negatives are breathability, compressibility and weight. Tip: Based on my experience, if you prefer natural fibers and wear primarily cotton or wool, and sleep with a down comforter or cotton/silk/wool blankets at home, you won’t like a synthetic bag. I bought one, trialed it one night, found myself sweaty, and immediately exchanged it for a down bag. The cost savings wasn’t worth it. Historically bags have been rated based on outside temperature (i.e. 25-degree bag), but since there was never a uniform method established to measure bag to temperature, this was an unreliable sales tool and a bit like comparing apples and oranges. We are starting to see labels using the European Norm (EN) 13537 testing protocol which divides temperature into upper limit, comfort, lower limit and extreme, with the comfort rating most applicable to women who usually require an extra 10 degrees of warmth. Tip: Unless you are going to have multiple bags for different conditions, I recommend a 0-20 degree bag. It’s easy to use as a quilt or go without in warmer temperatures. If you are using down, it’s important to fluff your bag well and redistribute feathers before going to bed to maximize thermal benefits. Proper storage and cleaning of down bags is also keep to maintaining loft. While the most common shape may be mummy, other choices include rectangular, female-specific, hooded, wide, tall, short . . .
I’m a bit claustrophobic so when I found a wide-width, female-specific, hooded bag I thought I struck gold. The integrated pad sleeve was a bonus, or so I thought. Lessons learned: (1) the pad sleeve prevents side sleepers from being able to snuggle into their bags and positions the hood at an awkward angle; and (2) wide bags for smaller people create lots of dead space impossible to keep warm. I was concerned initially when I switched to a mummy bag without a hood. Although I’d prefer it a tiny bit wider so I could sleep in fetal position, I’ve adapted and sleep much warmer than in my previous bag. ZPacks bag length is intended to reach your chin; they recommend increasing by a size if you want to cover head. However, it’s best not to breathe into bag as it will increase condensation. A better option is using your down puffy to regulate head/face temperature. I bought up one size so I have room to shelter my shoulders and neck. Your budget will most likely affect this choice and one of the reasons you should select your pack last. Sleeping bags can take up a lot of room. Tip: Except in inclement weather, I don’t pack my bag in a compression sack, electing instead to use it to fill space around my other packed items. Don’t feel married to using a sleeping bag. There are several other choices to be considered. Pillow – Most use clothes in a stuff sack as their pillow, but lightweight inflatable pillows are now a very viable option. Tip: under inflate for improved comfort. Liner – If you need a little extra warmth, you might consider a silk or fleece bag liner. The sleeping pad industry has been busy coming up with lighter, more compact, and more comfortable pads. There is nothing like a bad night’s sleep to ruin your trip. Previously I always experienced hip pain, as I’m a side sleeper, but when I found the right pad, it became a thing of the past. Closed-Cell Foam – These are a solid foam type mattress. What you see is what you get! Definitely more durable and since not inflatable, no worries about leaks. Very popular with long-distance hikers. The least expensive option. I’m currently using the Gossamer Gear 1/8″ Thinlight Pad in conjunction with an air chamber type pad. Open-Cell Foam – This is probably the most popular type of mattress. They usually self-inflate. Air Chamber – These will remind you of pool blow-up mattresses. The benefit is they are light and pack very small. They are the most expensive option. Tip: underinflate to improve comfort. While I’d prefer to use the very popular Thermarest NeoAir XLite, I can’t tolerate it’s surface noise (think potato chip bag). Thus my compromise pad is the Gossamer Gear Air Beam Sleeper mattress. Width – You’ll want to take note of the manufacturer specs. My regular size is quite narrow thus requiring me to be mindful as I switch positions. Height – Varies considerably from about 1/2″ to 4″. Your level of comfort may be affected by the thickness of pad, but not necessarily. The Air Beam Sleeper mattress I’m using has no R-Value, thus I use the ThinLight pad on top of it when warmth is needed. To my knowledge this pad has not been rated, but it doesn’t seem to transfer cool temperatures. As with your everything else, your budget will affect these variables. Pads can take up considerable space in your pack, another good reason to purchase your pack last. Having the right bag and pad will help keep you warm and comfortable, but there are other factors which will affect a good night’s sleep. Sleep Clothes – Having warm dry clothes to sleep in will not only help keep your sleeping bag clean but will eliminate chill from perspiration absorbed into your hiking clothes during the day. I’ve heard slightly loose-fitting clothes keep you warmer than tight fitting, of course I’ve also heard naked is the warmest. (4) If your feet are cold, place the foot of your bag in your backpack. YES, I know there are ways I can lighten my base weight. But in my sleep system department, I’m about as low as I can go except for eliminating my pillow at 1.5 ounces. My BASE WEIGHT is about 14 pounds, with my HYDRATION gear representing 5% of the weight at .7 pounds. There are four primary categories of vessels in which to transport your liquids. Many hikers will carry more than one type. You’ll need to consider capacity and function when making this decision. Hydration Bladder – Very popular, but they come with some challenges. Placement in pack – Most packs include a compartment along your spine for this purpose. 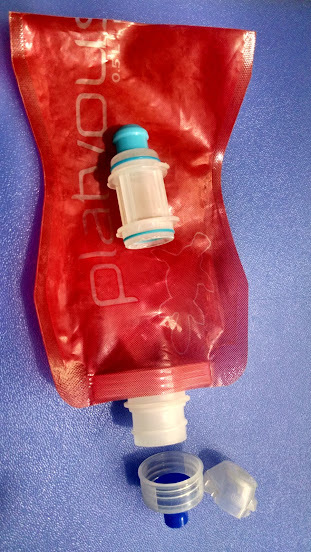 The challenge is knowing when the bladder needs to be refilled and how to refill without unpacking your bag (reference Sawyer Fast Fill Adapter). Tip: When I carried a bladder, I placed it on top of my pack liner with my down jacket covering it to keep it cool, and opening/hose insert face down for improved flow. Potential Leaks – Plan for the inevitable by placing all your gear in a pack liner except the bladder. Bottles – Nalgene bottles are probably the most popular, followed closely by Gatorade and SmartWater bottles. I typically carry a 700ml SmartWater bottle. I use it for my flavored beverages and for gulping or glugging water (otherwise I drink from a hose). Collapsible Bags – These have become extremely popular over the past few years as a lighter more compact way to store water and are especially helpful when additional vessels are needed for long dry stretches. I’ve tried several brands and found I prefer Evernew. The 1500ml (or 1.5L) capacity works best for me as I use the bag in conjunction with the Sawyer Squeeze filter and have a harder time squeezing larger bags. There are five primary categories of water treatment. With plenty of opinions and choices, your choice may be somewhat dependent upon your water source and somewhat upon your concerns about water-borne illnesses such as Giardia, E. coli and Cryptosporidium. Filter – The most popular types of filtered treatment are pump and hollow-fiber membrane. You will want to compare the specs on filters to ensure you are receiving the protection expected. In my opinion, Sawyer is at the forefront and in my opinion their specs should be used as a measurement standard. Pump Filters – This method was the first in modern treatment. It is labor intensive, but one of the benefits is that it can be used in very small pools of water, where filling containers for other treatment may be a problem. While pumps tend to need more cleaning and maintenance than other options, the positive is that they can be taken apart easily for infield repair and maintenance. They are also heavier and more bulky than the other options. Squeeze Method – Sawyer invented this technology and it has revolutionized filtering. A “dirty bag” is filled with water from the source, then connected to the filter and squeezed into your clean vessel. You can use the Sawyer PointOne or Mini for this purpose. I’ve tried both Sawyer filters and found I prefer the efficiency of the PointOne, even though it’s slightly larger and more weighty. Gravity Method – I believe MSR or Platypus were the first to create this method. A “dirty bag” is filled with water from the source. 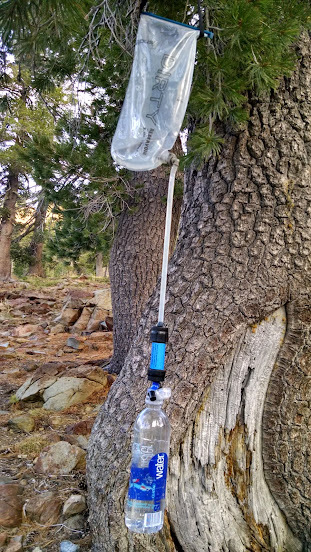 The dirty bag is hung from a tree or elevated on a rock or log, the filter is attached between two sections of hose and your clean vessel is quickly filled with no effort on your behalf. You can also use the Sawyer filters as a gravity option (tip: loosen the connection coming out of the bag to stop the flow). In-Line Method – With this method, your hydration reservoir becomes the “dirty bag.” It is filled with water from the dirty source, the filter is spliced in your drinking hose. I use this method as I find it a very efficient way to filter on demand. The flow through the hose may not be quite as efficient as without the filter. Most filter manufacturers sell an adapter kit, if not, it is fairly simple to create your own, and with the new Sawyer Mini, an adapter is no longer needed. I use the in-line method as I don’t like to take time to filter. I’d rather filter on the go. Ultraviolet – SteriPen is the only brand I’m aware of offering an ultraviolet solution. There are several models and just like chemical treatment, there are similar issues to be researched. No Treatment – There are plenty of hikers who have not gotten sick from drinking untreated water. Decide for yourself if the risk is worth it. Scoop – sometime it’s challenging to fill your vessel directly from the water source. I’ve created three light-weight scoops that all worked. Field Cleaning of Filter – Sawyer provides a syringe to backflush the PointOne and Mini filters. A more efficient option is to use the blue fliptop from a SmartWater bottle. Tip: Remember to use clean water in a clean vessel. Be aware of pressure applied). Inline Option – I’ve created a system using the collapsible bottles. See below. Sawyer Adapter – attaches to both sides of the PointOne Filter. If using the Mini, no adapter is needed. Jan’s Adapter – Drill a hole in the middle of a soda bottle lid. Insert a 1/4″ dual barbed connector with superglue. YES, I know there are ways I can lighten my base weight. I could forego treatment, or replace my filter with Aquamira, and eliminate my scoop and inline accessories, but I like these items so for now I’ll carry the weight. My BASE WEIGHT is about 14 pounds, with my ELECTRONICS representing 20% of the weight at 2.8 pounds. Electronics are probably one of the most controversial gear-related topics. You’ll find lovers, haters and a full spectrum in between. With these devices representing a whopping 2-3 pounds of my base weight, I’ve obviously decided they are an important part of my backpacking and hiking gear. Without these devices, I would be less likely to explore, especially solo, as I do not have a good internal compass and am not as proficient as I should be with map and compass navigation. Tips: Go prepared for phone failure. Mine has malfunctioned, I’ve broken the screen, and one time I even lost (and found) my phone on trail. Know how your apps work and practice, practice, practice. Learn the best way to conserve battery life. The GGS DC LCD Screen Protector is a great solution for preventing scratches on non-touch screens. These are not like the cheap protectors. They are a harder plastic that doesn’t scratch, tear, peel, and is easy to clean without any degradation in visual quality. I’ve used them on my last 3 cameras and never allow myself to use my camera until one has been installed. Consider WiFi memory cards (i.e. ezSh@re) if you want the convenience of transferring photos from your camera to phone for upload to your blog, instagram or facebook (without internet access). If your photos are as important to you as they are to me, you may want to bring along a second battery (in case the primary battery fails), and a second memory card (in case your primary memory card fills or fails). I call this insurance! There are basically two types of devices. I purchased the InReach SE in summer 2014. I can’t say enough good things about this device. It has given me freedom and security. What do I like about this device? Tip: If you want to carry a standalone GPS you might want to consider the InReach Explorer which combines GPS and SOS devices. Standalone GPS units tend to have many more features than phone apps, but can also be more complicated to use. The two most popular brands for outdoor activities are DeLorme and Garmin. There are lots of reviews and options; I don’t love mine so can’t share any recommendations. Carrying a unit you don’t know how to use or a dead one, is just worthless weight. On the other hand, they can be lifesaving, very helpful on finding trails, staying on trails, going cross country off-trail, etc. While I use my phone for my music, audio and e-books, you may prefer an electronic reader and music player. Just like everything else in backpacking it’s a personal decision. External Battery – This is the most common solution and there is a huge variety to choose from based on size, weight, capacity and price. The two most popular brands are New Trent and Anker. When attached to pack, the device being charged needs to accept trickle charge otherwise you’ll lose the benefit as the device turns on and off when traveling under tree cover or through shaded areas. Most external batteries accept trickle charge. If hiking in shaded areas (i.e. canyons) or in cloudy areas, it’s probably not worth the weight. I drilled holes in the four corners and inserted Nite Ize S-Biners to attach to my pack. Carrying electronics on hiking or backpacking trips most likely will result in accidental damage to your device. I consider myself careful and I take extra precautions to protect my devices, but yet I’ve still had more than my share of electronic accidents. I dropped my camera in a creek, cracked the screen of my camera when I sat on it, scratched the screen of my phone on granite, scratched my camera lens . . . . So now I buy SquareTrade Electronics Accident Protection Plan for my phones, cameras, GPS units, etc. Go prepared to protect your electronics in inclement weather, during freezing temperatures, in extreme heat, down scree fields, through water crossings, etc. The weight and purpose need to be considered when packing electronics. If not careful, soon your devices plus batteries will add pounds to your pack. YES, I know there are ways I can lighten my base weight. I could eliminate either the external battery or the solar charger which would save 9 ounces. I could also eliminate my camera which would save another 10 ounces. BUT I love having my camera and want the insurance of having both my solar panel and external battery, so for now I’ll carry the weight. My BASE WEIGHT is about 14 pounds, with my SHELTER representing 17% of the weight at 2.5 pounds. If you prefer “Cowboy Camping” or sleeping under the stars, you can enjoy a few less pounds of weight in your bag and a lot fewer decisions, that is unless a thunderstorm comes along . . .
(1) RATING: 3-season tents are most common, with 4-season reserved for those doing winter camping. You definitely want waterproof vs water resistant. (2) SIZE: Interior dimensions are usually a much better indicator of size than the generic “one or two person” label. I recommend you pay special attention to floor or footprint dimensions, as well as height dimensions, especially if you are tall, large or claustrophobic. Tip: Tape out the dimensions on your floor then lay down with your mattress and gear to get a better idea of size. (3) SET UP: I prefer free-standing tents as they can be set up anywhere, can be relocated easily, and are usually quicker and easier to set up than stake-dependent shelters, which tend to weigh less and pack smaller but can be problematic in rocky and hard soil areas. Tip: If you’ll be hiking in inclement weather, consider tents that allow for dry set-up. (4) ENTRY: Side or front entry is really a personal preference. For me this is one of those “line in the sand” decisions. It’s side entry or nothing! The reason for this preference is ease of getting in and out of the tent. Front entry requires crawling, while side entry allows for swinging your legs out of your sleeping bag and into your shoes, as well as plopping your fanny on the bag (and pad) upon return to remove your shoes, and with a quick swing of the legs your back in your bag. A wonderful luxury especially for those middle-of-the-night escapades. (5) CONSTRUCTION: My preference is double-wall (aka rain fly) construction; however, the weight and packed size of single-wall construction make it a more difficult decision. The negatives of single wall can be condensation problems, resolved primarily by lots ventilation which can result in drafts, chillier sleeping, plenty of dust or sand during storms, and needing to avoid the sides of single-wall silnylon tents to avoid water penetration. Single-wall tents are usually only sold by cottage manufacturers. Tip: Look for taller bathtub walls to minimize drafts and rain splash. (6) WEIGHT & PACKED SIZE: Several factors affect weight, most significant are size, fabric, construction and frame. Packed size is based on similar parameters. The most common waterproof, lightweight fabric today is silnylon (silicone coated nylon). Cuban fiber is lighter, but is also significantly more expensive. Denier nylon, taffeta and polyester are the mainstay of medium weight backpacking tents. Single-wall silnylon will have sealed seams (many times done by user), while cuban fiber and double wall have taped seams. (7) STORM PERFORMANCE: I can’t emphasize enough my recommendation to read reviews about the performance during a storm. Wind, rain, hail, thunder and lightening WILL happen in the mountains. Go prepared! (1) You can save weight and space by going without one. Most tents have fairly tough floors, but you’ll need to be more careful about site selection. (2) Most big name manufacturers will sell matching footprints. These tend to be expensive, and weigh a bit more than other options but they may allow for a dry-tent setup and/or an option to forgo the tent body and use the fly and footprint for shelter. (3) Tyvek is an extremely durable choice and many times can be picked up for free from a construction site, can be purchased at your local home improvement store, and from many of the ultra-light tent manufacturers. Tip: To soften the Tyvek, wash and dry in your home washer and dryer. (4) Polycro is the lightest, most compact option and it’s surprisingly durable. It’s also quite inexpensive. My first backpacking tent was bombproof, but at 5lbs it was not a feasible long-term solution. I replaced it with a Tarptent Rainbow. The reasons I selected this tent were weight, size, and it’s free-standing option. I used this tent for about five years but never grew to love it. The drafty ventilation at shoulder height was my biggest complaint. I also wasted time futzing with the guy lines trying to get perfect corners. I don’t think it’s a good option for perfectionists. NO, but it has one side, good enough for me! YES, I know there are ways I can lighten my base weight. Beyond replacing my tent, I could eliminate the ground cloth which would save 1.4 ounces. BUT I like having a separate ground cloth, so for now I’ll carry the weight.